After dinner I hopped on the XT-250 and went up Ouray County Road 4. I went over it last week and found that the recent torrential downpours had wreaked havoc with the road. This evening I found that the county has dragged the road, which has cut down on rough spots and filled in some of the ruts, but not everywhere as the photo shows. The road in the photo is steep and the water, which should find the ditches on either side of the road, instead overwhelmed the ditches and spilled onto the road, cutting it up. All the gravel and dirt roads around here are the same. 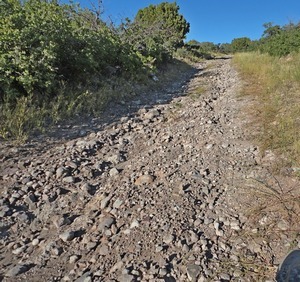 I also traveled along Lower Powerline Road up to Kinikin and then back on Pahgre. Parts of the Lower Powerline Road have been dragged, resulting in more loose dirt. There’s one slope where my rear wheel was spinning and losing traction (and, mind you, my bike is only 250cc) because of all that loose powder. Again, after the next rain this problem should go away. This entry was posted in Montrose County, Motorcycling, Ouray County. Bookmark the permalink.